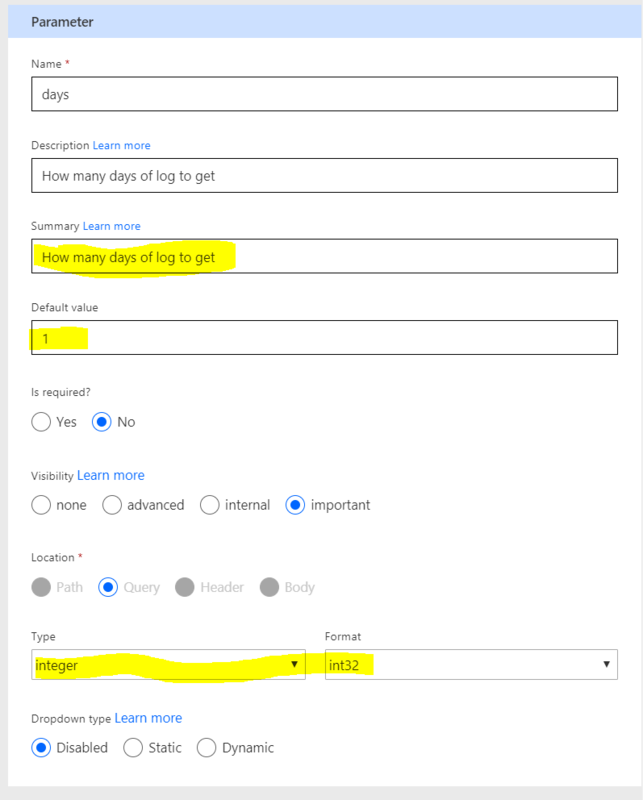 The advantage in comparison to using the inbuilt Office365 log analysis is that you are not limited by log expiration periods (typically only the last 90 days are available) and with the data in a standard relational format you can use it for comprehensive analytics in Power BI. 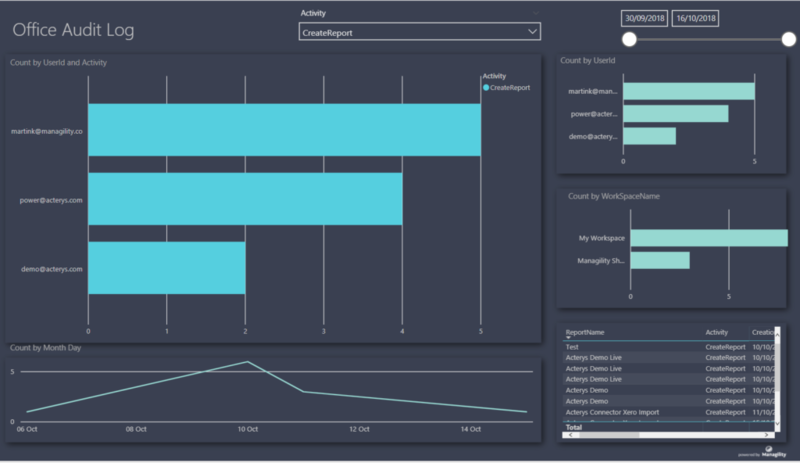 The usage metrics in Power BI give you limited analysis options but only for one workspace. We were inspired to write this blog by Neale Analytics’ template (https://powerbi.microsoft.com/en-us/blog/announcing-the-power-bi-usage-metrics-solution-template/) that is also using Azure functions. 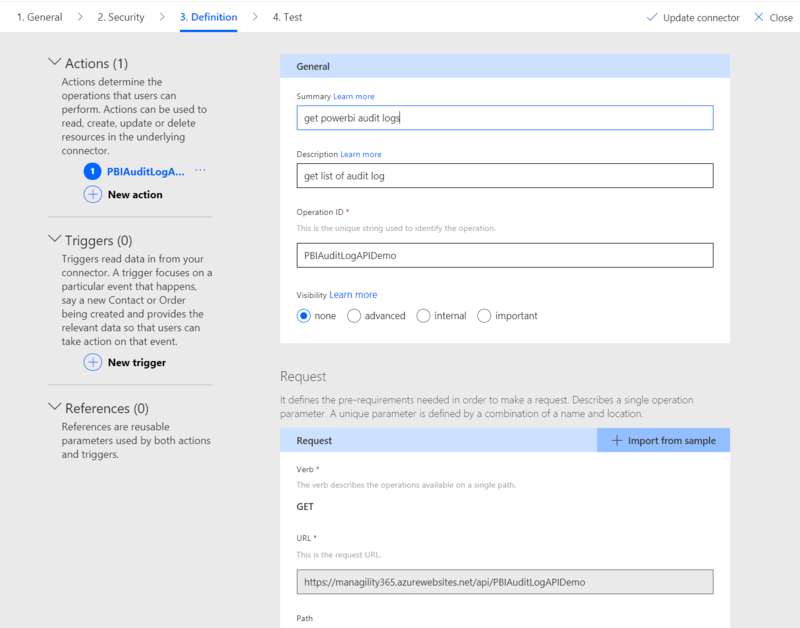 We have added automation with Microsoft Flow and Power Query and are also covering secure password encryption. 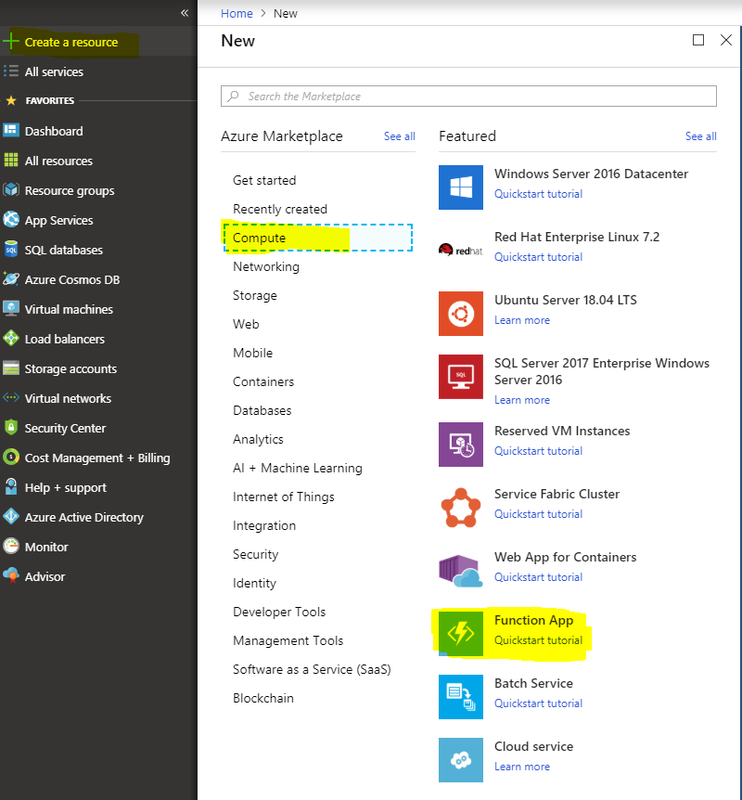 An Azure function app is the container that hosts all the individual execution functions. 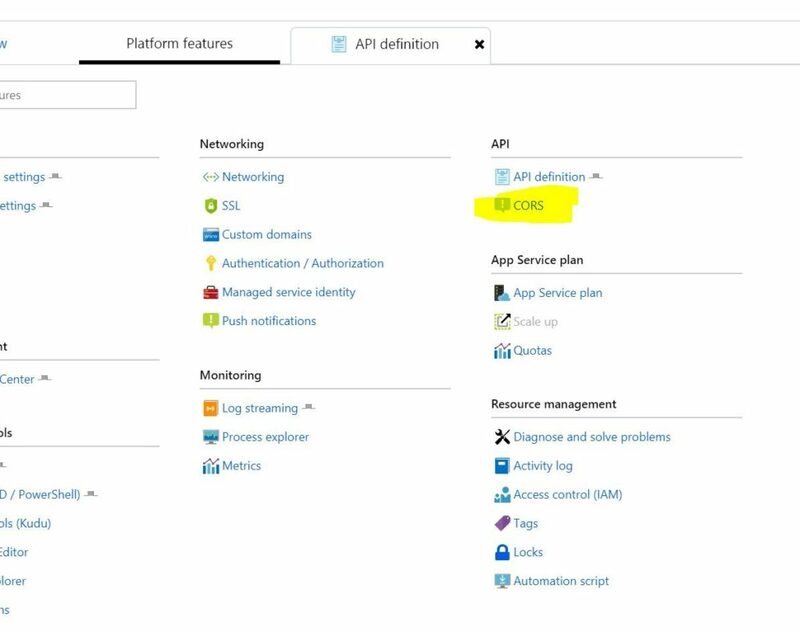 The function app is created in the App service hosting plan. Step 1: Login to Azure portal and Select Create a resource on the upper left-hand corner of the Azure portal, select Compute, then Select “Function App”. 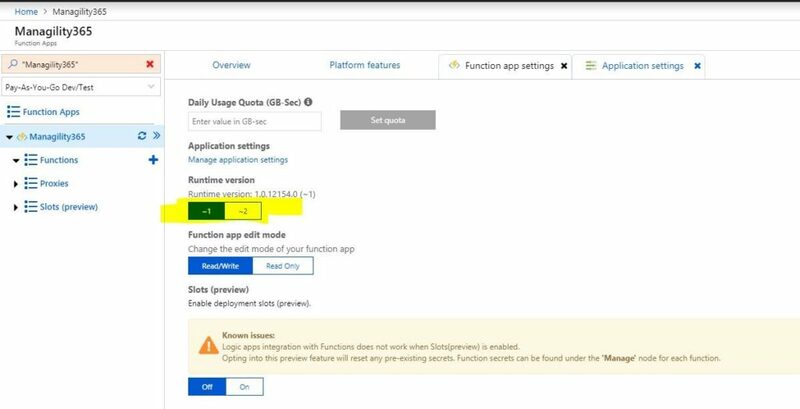 Step 2: Create Function App settings as specified below: (you can have your own App name or choose a different Application Insights Location), once all are set click on “Create”. 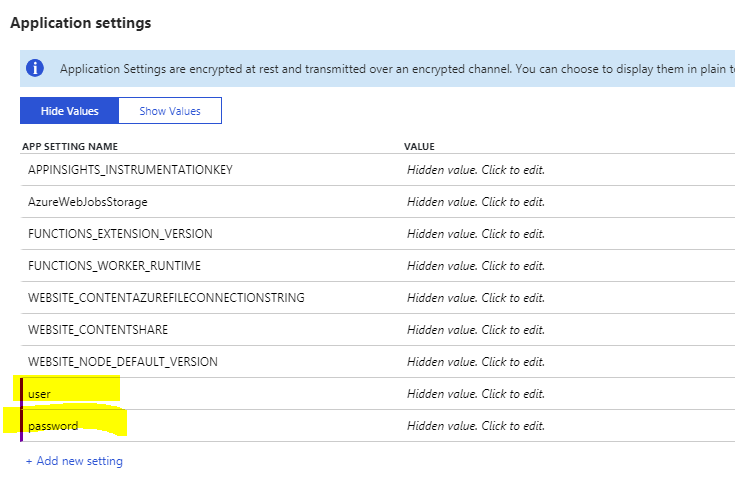 For the Consumption plan, Azure functions are nearly free in regards to computing charges. The basic plan will give you 1 million executions and more than 400,000 (!) GB of bandwidth, which is more than enough for our purpose. 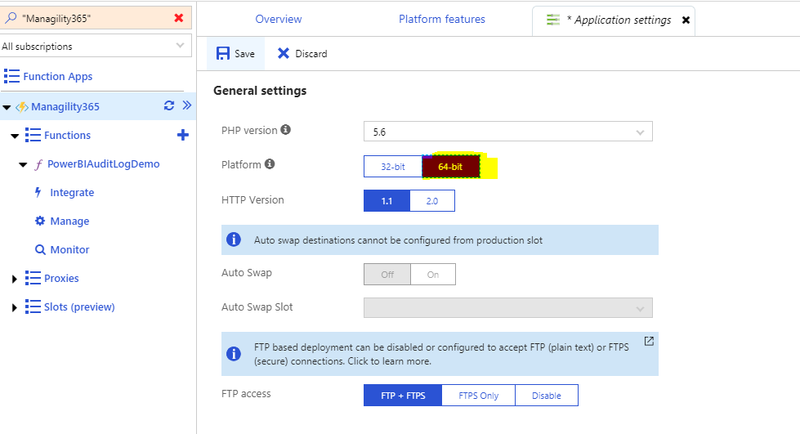 The only limitation of this plan is that, the Azure functions execution cannot exceed 5 minutes, after 5 minutes, the execution will be automatically terminated, this is due to the virtual machine backed. If you have functions that may potentially exceed 5 minutes, you might need to choose another App service plan. 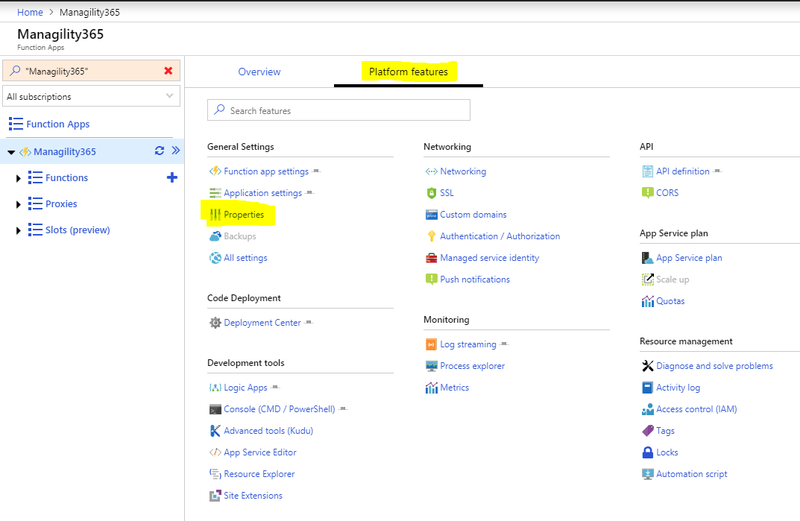 Before we created the Azure function, make sure that we need to set the Azure App runtime to version 1. Next, click Functions Item on the left-hand menu, and select “New function”. We will create a HTTP trigger Azure function, ensure that the Experimental Language Support is enabled. Fill out the Function name at the right hand side when prompts, and click Create. 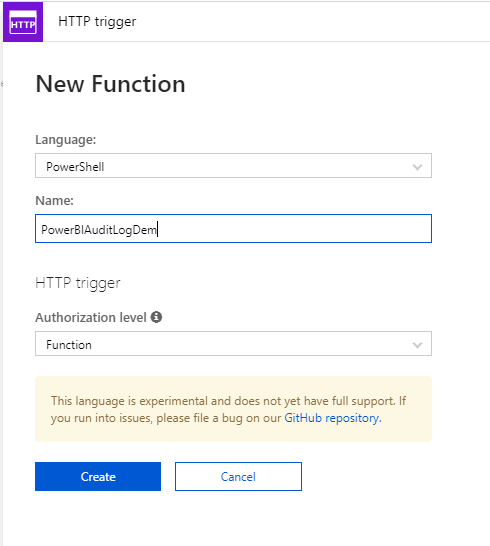 For reading the Power BI logs we will be using a Powershell script. 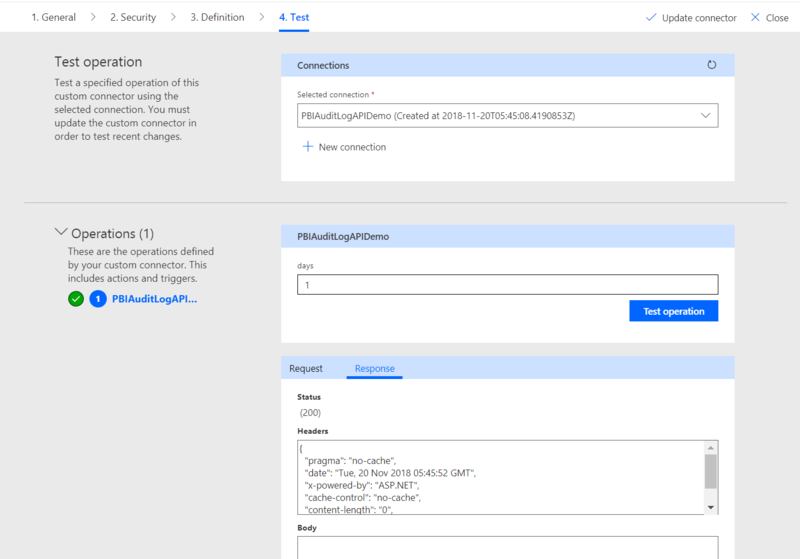 This script will require the installation of the MSOnline module to connect to Office365. 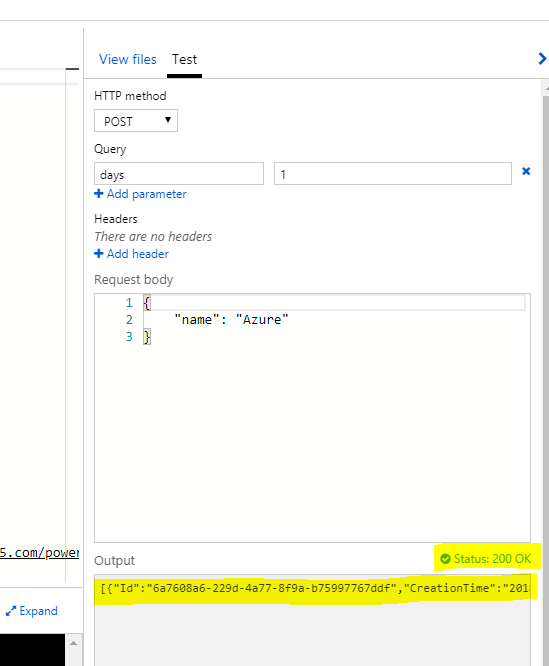 The MSOnline Powershell module has to be uploaded to Azure FTP. First, we need to retrieve the Azure FTP details from the Azure portal. Select the name of the Function Apps on the left hand menu, and select Platform Features on the right hand tab. 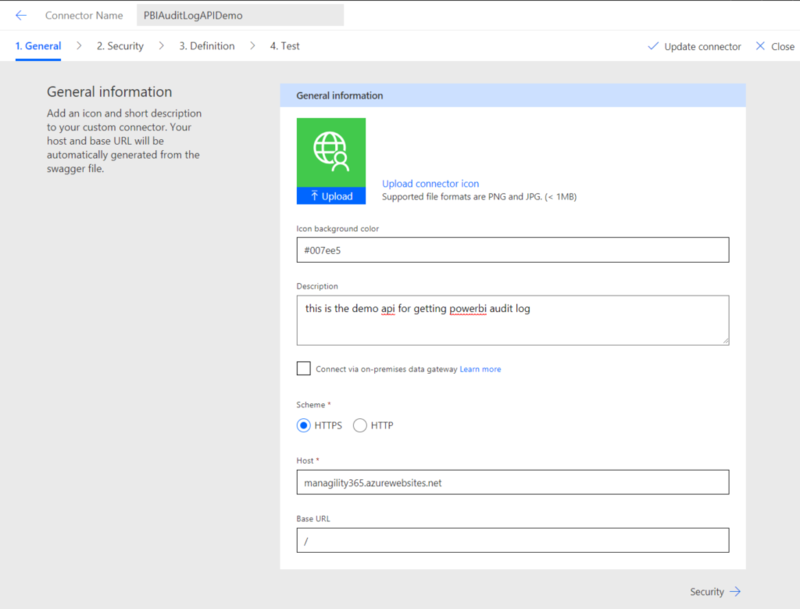 If you have not setup the deployment credentials, click Deployment credentials, to setup the FTP credentials. 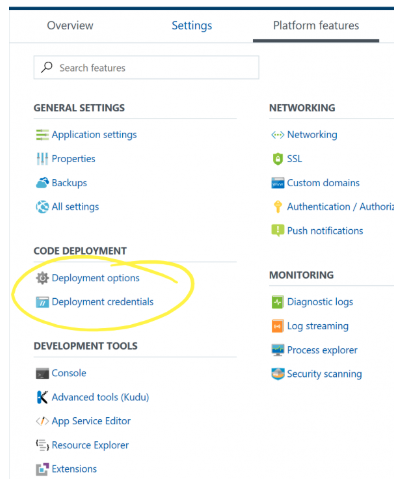 Once the deployment credentials have been setup, you can click Properties in General Settings. 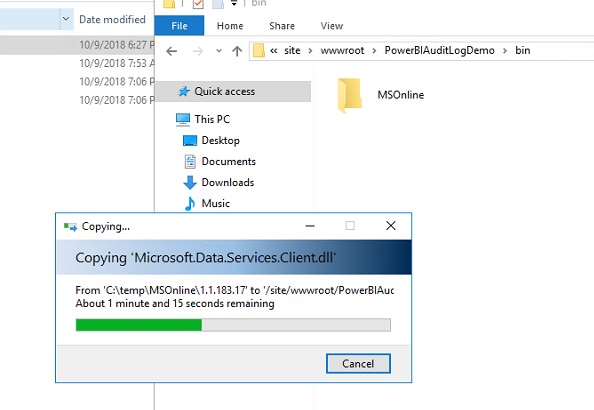 Just copy the FTP details into your notepad, you will need this to connect to the storage of the function and upload the Powershell MSOnline Module. 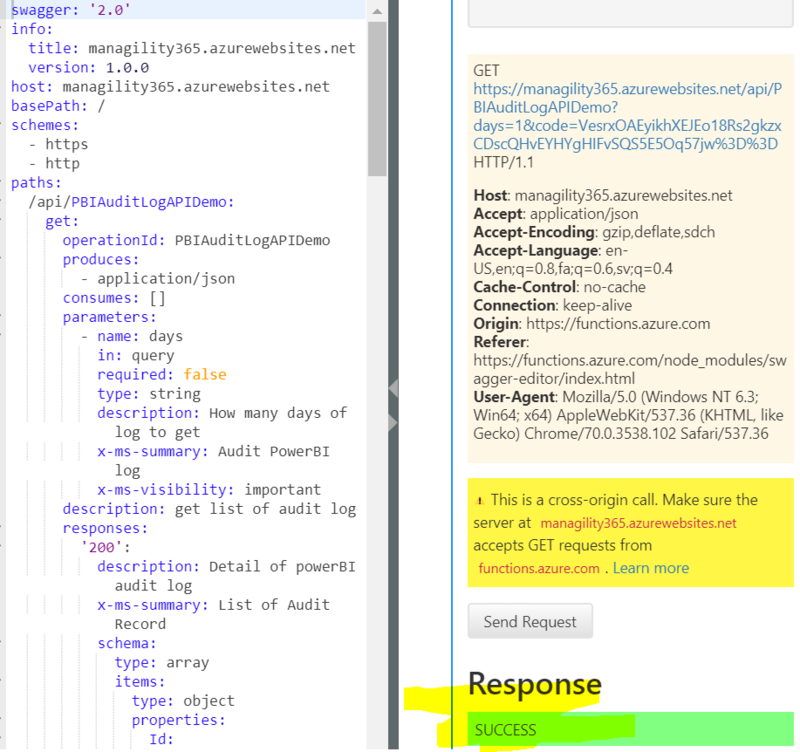 After running this code, you will see that the MSOnline module folder has been created. 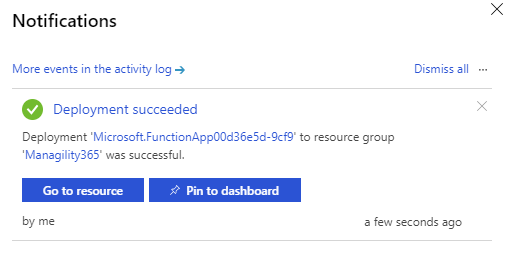 Next, let’s upload this module into Azure function storage via FTP, copy the URL that you have pasted in your notepad, enter the username and password. 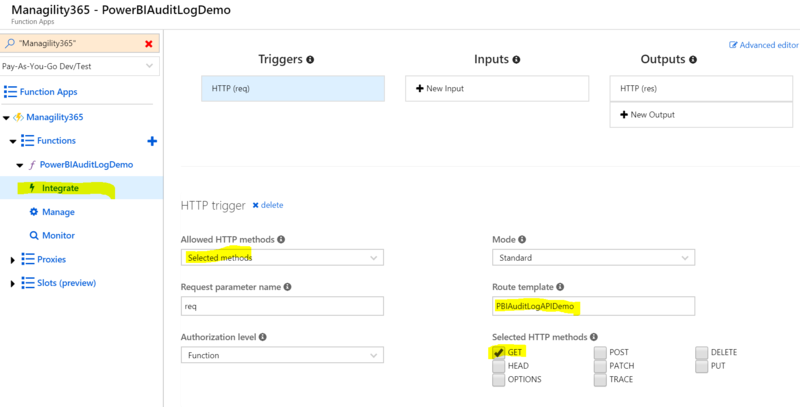 Navigate to your FTP to your azure function folder, the folder path is site/wwwroot/<YourFunctionName>. Create a new folder called bin. Next, open the bin folder, and copy the MSOnline module that you have downloaded in C:/tempFolder. 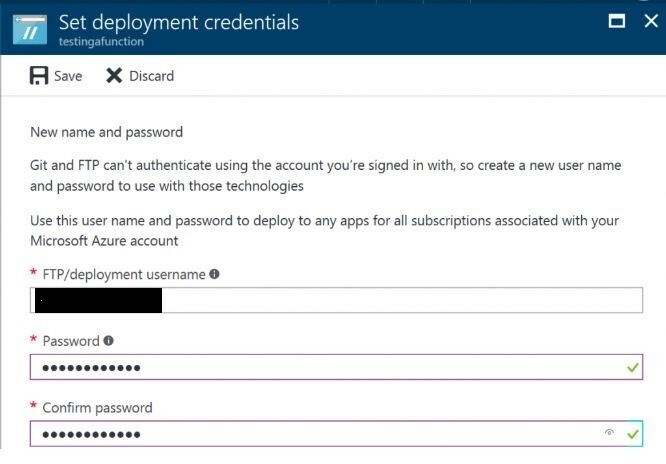 For the MSOnline Powershell module, we need to use Office365 credentials within the Azure function App, as we don’t want to expose our password in plain text, we need to encrypt our password. 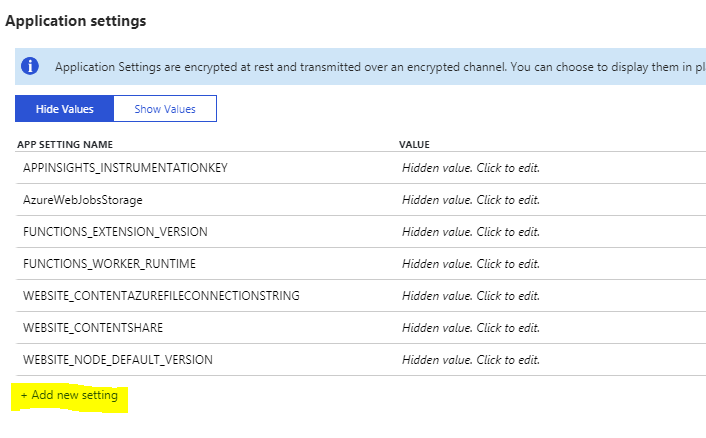 Let’s use Powershell to generate encrypt password to be used in Azure Function. After running this above code, it will generate two files with your input password to encrypt in your C drive tempFolder. 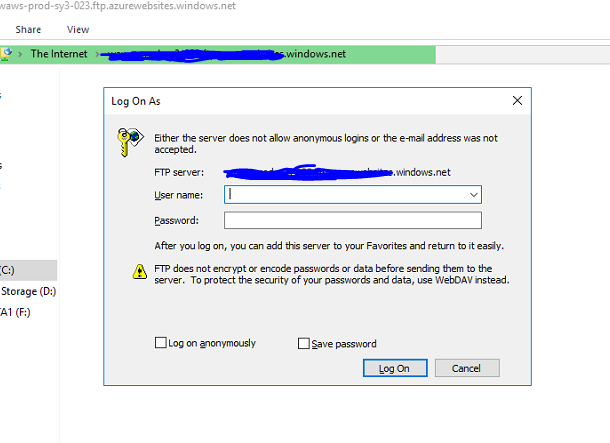 Upload your Password.key file into your FTP bin folder. We will set the username and password into application setting as environmental variable for the admin account or the user account that has access to the PowerBI Auditlog permission. Let’s return to the Azure function, Select Platform Features, Select Application settings. Ensure that the Platform uses a 64 bit run-time. 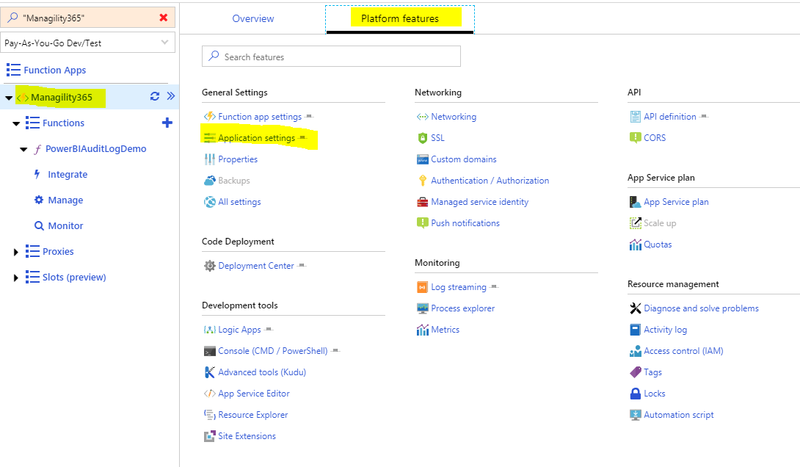 In the application setting, we will create two environmental variables for Azure function use. Click “Add new Setting”. Add a user variable for your admin account or the account with Audit Log permission and add a password variable, just copy the content of the “EncryptedPassword.txt” file in the value filed, once you have done that, you can delete the “EncryptedPassword.txt” file in your local computer. Click Save at the top right panel. 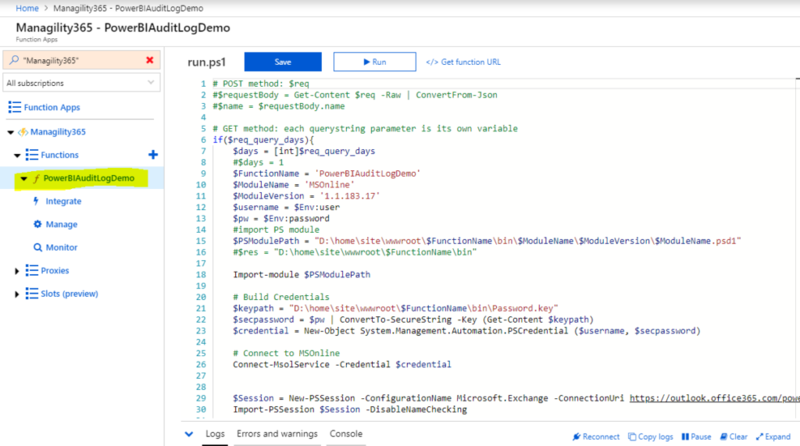 Click the left hand menu function name, copy the PowerShell Code into run.ps1, Update the variables on the top of the script and ensure they have matched the function name, MSOnline Module name and module version. You will need to also update the key path of your password.key file. Now, we will save it and test it. We have now successfully created the azure function in Powershell to retrieve the PowerBI auditlog records, Notice that I have put the days parameter as 1, which means I am retrieving only one day of Log records, we can also change the days parameter into a different number of days for which you would like to retrieve the log records. This will obviously increase the function execution time. 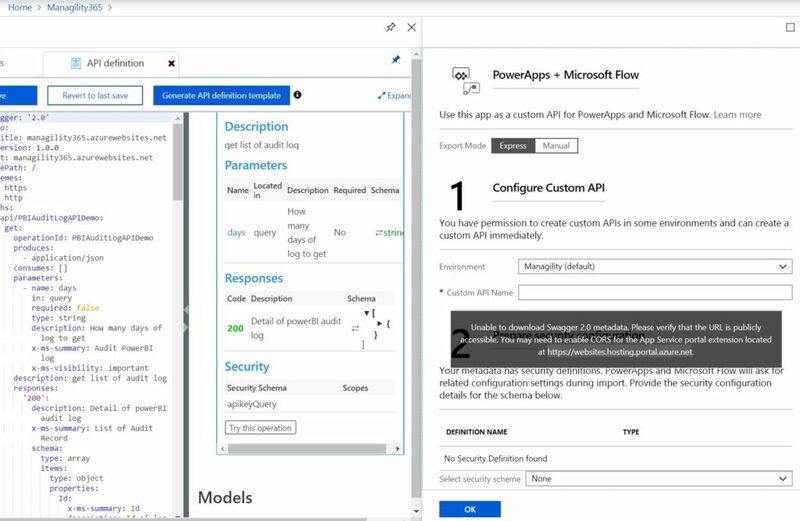 After we have tested the Azure function successfully, we can wrap up this azure function as custom API, so that the API can be called from MS flow, PowerApps or other custom applications if you may have. 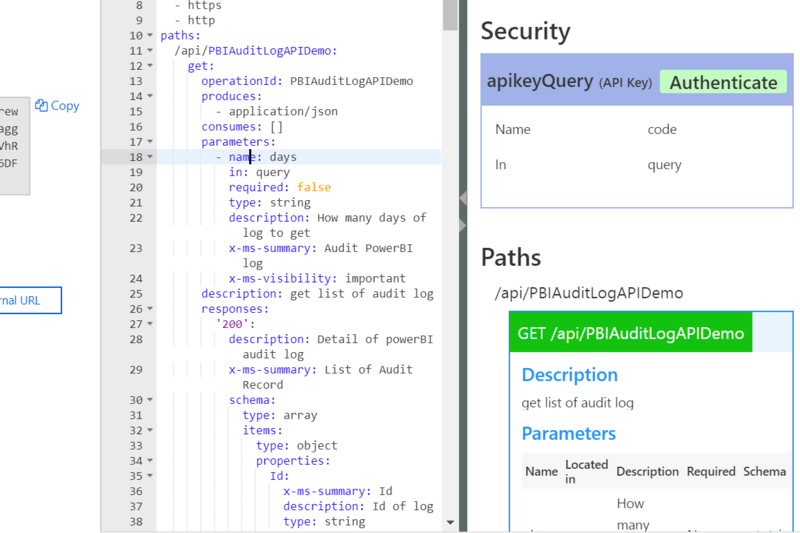 Navigate to the Azure function in Azure portal and select Integrate in the left navigation, we can choose HTTP methods for our custom API later on, here i choose GET method only as we will only need to get audit log from PowerBI, for the route template, I will input “PBIAuditLogDemo”. 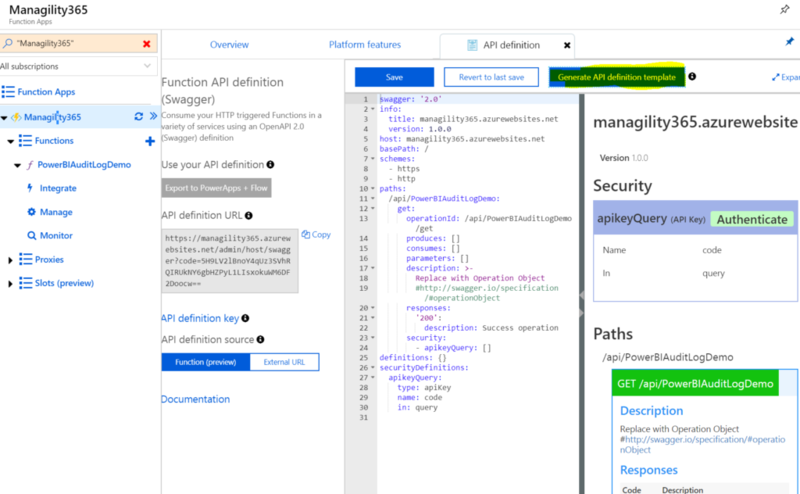 Select the function app at the left hand side and select Platform Features, then API Definition, after that, click the button Generate API definition template, it will generate the API definition template for us, then we can customize it later on. Next, we can customize the API definition, once finished, click Save. 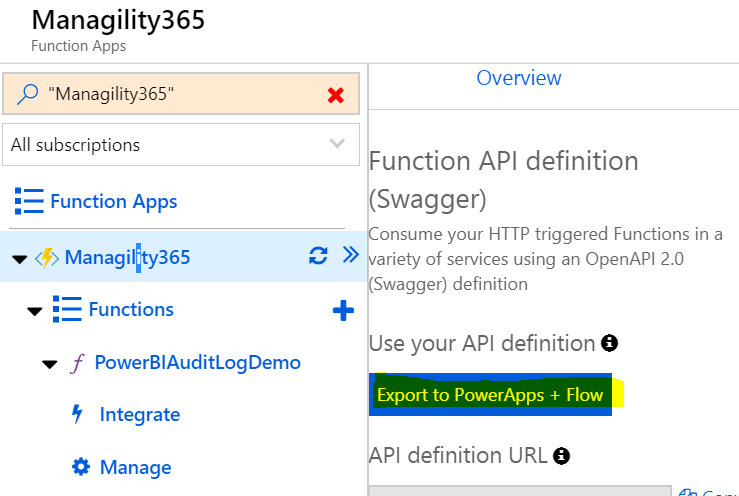 After saving the API, we can now start using this API, and manage the results in Microsoft Flow. If you get the error below, please add the web URL in the hint box into your CORS setting in the “Platform features” tab. 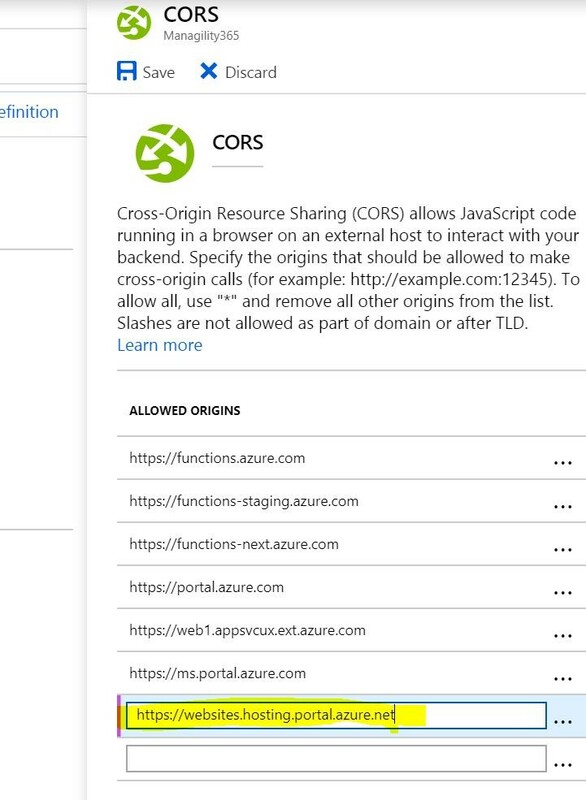 Add the URL into the CORS rule. Now we can try this operation and see if it works. Perfect! 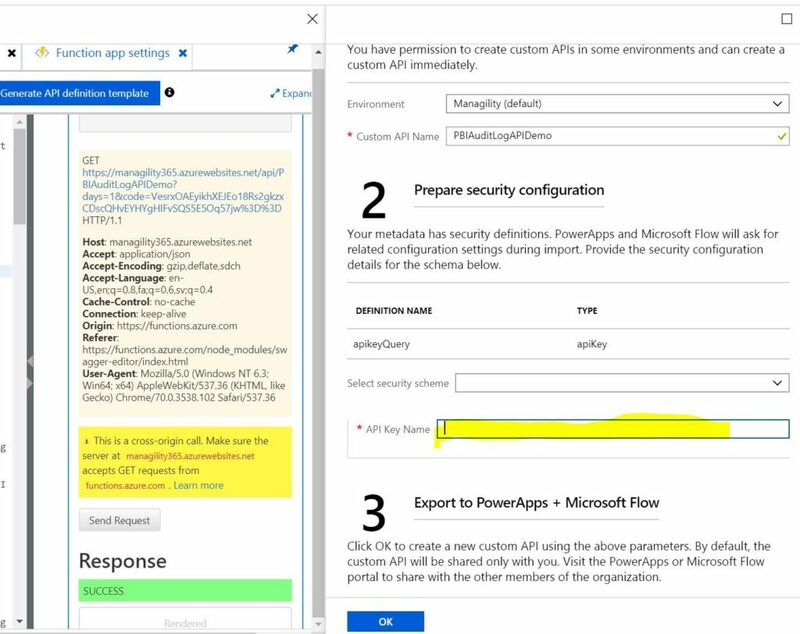 Next, Navigation back to the API definition and click Export to PowerApps + Flow Button, Fill in the Custom API Name and select the security schema, then click OK.
To get the API Key Name, we can go back to the function, Click Manage, you can copy the key and paste it into the above API Key Name input box. After that, we have successfully deployed our API to Flow. 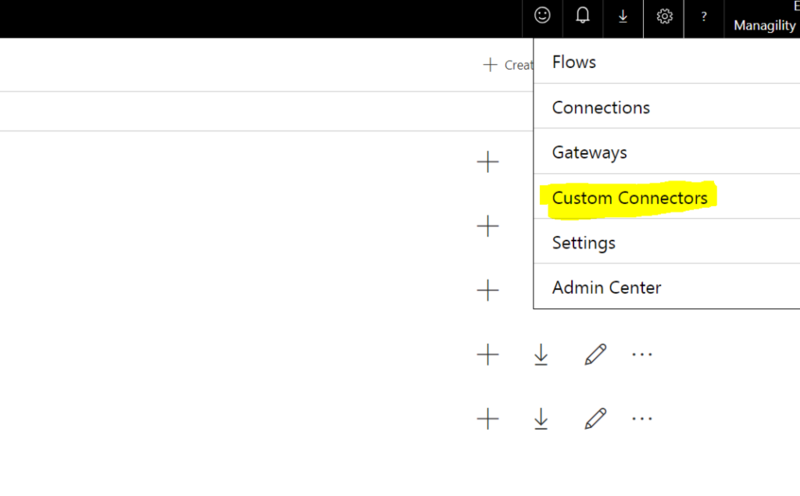 Login into MS Flow, and navigate to the right top setting icon, and select Custom Connectors. You can see your custom API is already there for you to set up, we need to create an action for the API calls, click the edit icon. In the “General” tab, you can fill out the general information like background color or description, you can also leave it as blank. Next, Let’s move on to the Security Tab, you can leave it as is. Move on to Definition Tab, Fill in the Summary and description. 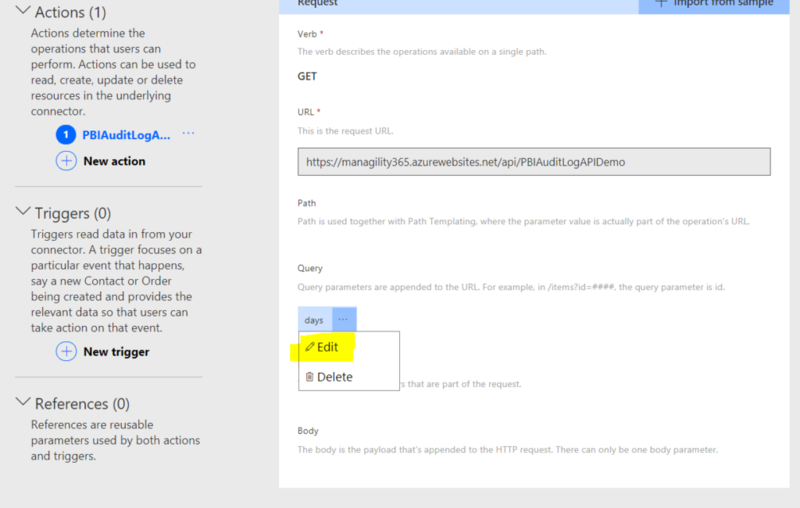 Configure the parameter, or you can leave it as default. Fill in the summary input, also you can configure the type of the parameter, setting up the default value. 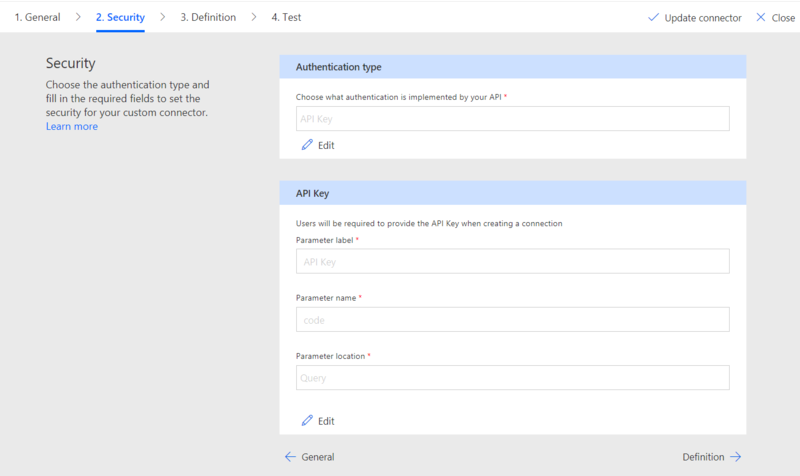 Now, we are ready to test our API actions, you must update the connector before we can test. Click Update Connector. After that, we can test it and run, in the following screen, it returns a “200 successful” response. 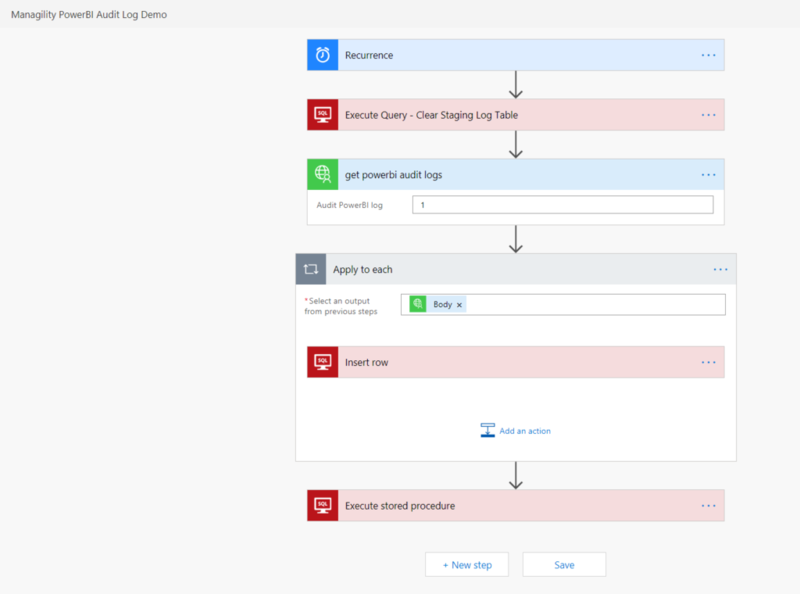 We can now use the Azure function in a Microsoft Flow workflow and insert the log records into an Azure SQL database . Next we can create the simple flow to insert log record into this table. 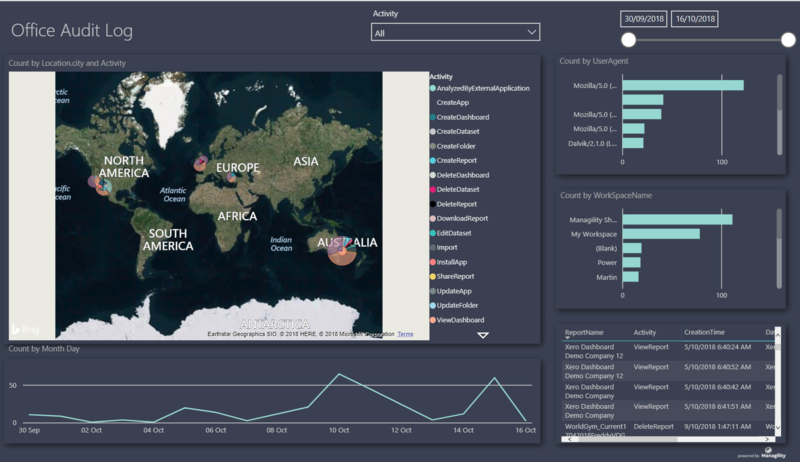 Below you can see two screenshots of a related sample Power BI dashboard. 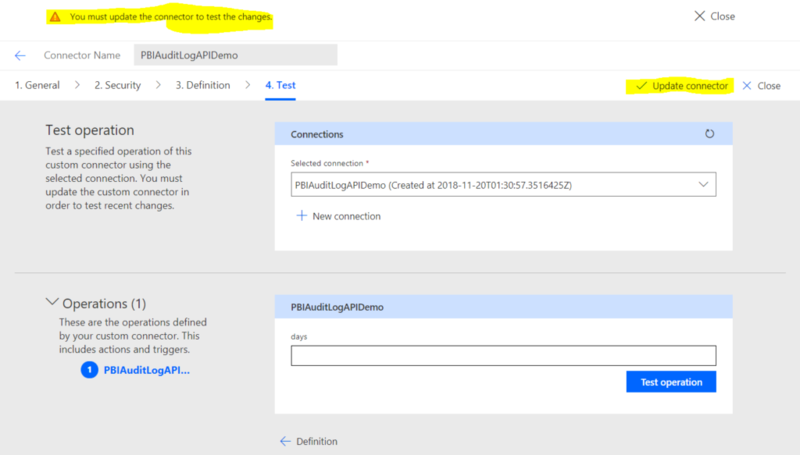 A special feature that you can see here, is that we are retrieving the geographic location from the IP address using an API call in Power BI. 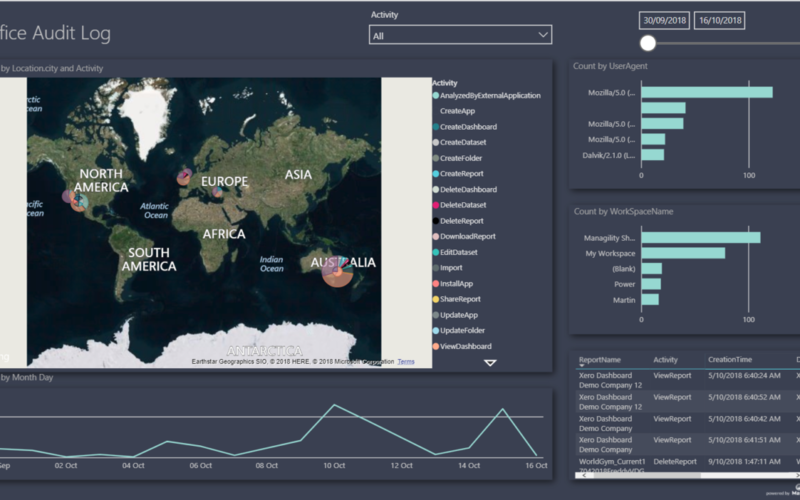 We will cover how this can be done in Power BI in our next blog.  Follow us on Twitter @managilitybi and stay tuned!